ONLY 500 YEARS TO LIVE … THE MAXIMUM ! The European Space Agency Friday launched three satellites, Ellel hopes to help understand why the magnetic field that makes human life possible on Earth, appears to be weakening . Satellites, including ESA Swarm project were launched from the Plesetsk Cosmodrome in Russia on a Rockot at 7:02 EST and were placed in near-polar orbit at an altitude of 490 kilometers ( 304 miles ) about 91 minutes later. Swarm data that is due to be collected for the next four years will improve the relatively vague understanding of scientific magnetic field that protects life on Earth from deadly solar radiation and helps the migration of certain animals. Scientists say that the magnetosphere is weakening and could completely disappear within 500 years as a precursor pole reversal and inversion of the magnetic field . All this has happened – the geological history suggests the magnetic field is reversed there 250,000 years , which means that , with the last event, there 800,000 years , the current situation , a reversal of fields magnetic . seems to be late. While the effects are difficult to predict , the consequences can be enormous. Satellites, among other essential communications, may be more exposed to the solar wind , and the oil industry uses readings from the magnetic field to guide exercises. » Swarm is an essential task , not only for Europe but also for the world , » said the Director General of ESA Jean- Jacques Dordain Reuters after launch. « We can not live on planet Earth without the (magnetic) shield. » The Swarm mission was developed and built by Astrium unit , European aerospace group EADS . 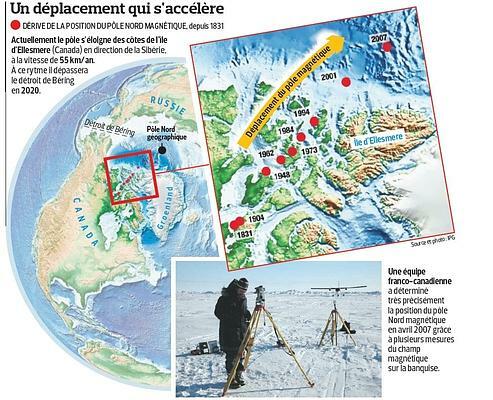 In 2007, I wrote an article in my forum ( http://lesporteursdufutur.forumpro.fr ) on the fragility of life and the inversion of pôles.Je then describing the discoveries of Themis -1 satellite reception gaps in the magnetic field of the Earth. The satellite Themis-1 ,in 2007. Breaches discovered by Themis-1 in 2007.The danger is growing. Magnetic anomaly observed in the South Atlantic: a magnetic reversal taking place? The Earth’s magnetic field, generated deep within the planet, is a shield against particle radiation from space. In the South Atlantic this shield is much lower than anywhere else in the world and therefore the space radiation penetrates deeper into the atmosphere. This region is known as the » South Atlantic Anomaly (SAA) » and the influence of the SAA is a known hazard to satellites, spacecraft and aircraft at high altitude. The entrance to the radiation in the atmosphere depends on the magnetic activity of the sun and geometry (or shape ) of the magnetic field of the Earth . Thus, to understand the space environment , particularly during magnetic storms , is important. Equally important is the understanding of changes in the magnetic field over time , the surface of the Earth. During a magnetic reversal ? The South Atlantic anomaly is known to be more extended and oriented to the west of South Africa, where the internal magnetic field rapidly weakens in this region. This may be the first signs of a change of direction coming into the internal magnetic field . We do not know in detail what exactly happens during inversions between the observed changes in the magnetic field and when the reversal is completed . However, these factors are important in knowing where the radiation risk may be increased and how the atmosphere might respond . Earth’s magnetic field has had many ups , downs and reversals in the past. The last reversal back to 800,000 years. Therefore , the earth is known to be able to regenerate its magnetic field. Understand the development of the SAA may therefore be significant in understanding the reversal process and its impact on life and the natural environment. An observatory on terrestrial magnetism , located in South Georgia , keeps track of the anomaly in the South Atlantic and notes the changes that occur in the center of the Earth. New data will be used to build better mathematical models for the magnetic field. These models can be used to deduct the evolution of the liquid flow in the outer iron core of the Earth . This fluid flow supports the magnetic field of the Earth and allows us to make predictions about future changes . NOAA National Geophysical Data Center maintains a set of annual magnetic north pole coordinates going back to the year 1590 , based on measurements at the beginning of logs to modern techniques. Noting that there have been many recent reports of pole shift , to the point where the phenomenon because of real problems people such as the temporary closure of airports, further investigation was required. After transferring 420 years of data from different positions of the north pole of the Geo Data Center , NOAA , the configuration to fit in an Excel spreadsheet , adding a complicated formula to determine the exact distance between 2 calculations of latitude- longitude, apply the formula to each point of the data series, and then finally traced all in a visual graph, it is alarming to discover the great distance traveled only poles in the last 10-20 years . 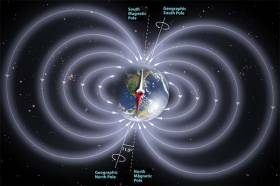 Since 1860, the movement of the magnetic pole has more than doubled every 50 years. It’s pretty important. Over the past 150 years, the pole shift has been in the same direction. Over the past 10 years, the magnetic north pole has shifted nearly half of the total distance of the past 50 years ! In other words, the pole shift has apparently accelerated significantly . The pole shift has more than doubled over the past 50 years. The current rate of switching the magnetic north pole is about 55 kilometers per year. According to the data set, in 2000, the North Magnetic Pole has moved more than 70 km. Now the problem is that since the pole shift amounted to a record high over the last 10-20 years in almost 400 years of data, the cumulative effect starts now be felt worldwide . Does the effects affect us little or going to the wrong way ? I guess time will tell, but at current rates , there will probably direct effects on many systems in the coming years , many of them will be nuisance issues such as documentation changes while others are likely to be severe. It is not known if the change will accelerate or slow down in the coming years . Some say that a pole shift is already late, and this phenomenon may be indicators of the beginning of this process. Note that the Earth’s magnetic field is what protects us from radiation. Without him, we would not have survived. Is a reverse polarity cause between the two » flip- flop » a period of time without any magnetic fields so that we would be exposed to deadly radiation? 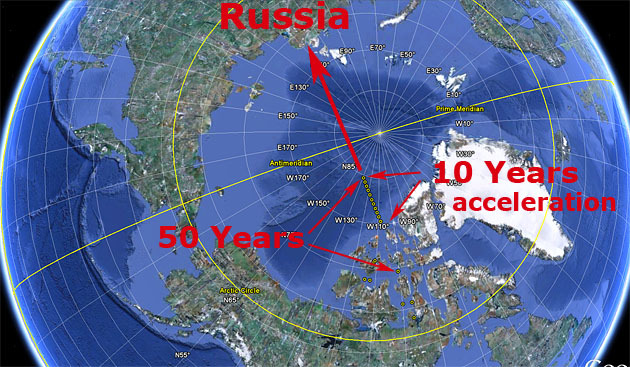 At the direction of the current , the magnetic north pole is heading directly towards Russia. The following image shows the dramatic acceleration while pointing out the last 50 years compared to the last 10 years of the movement . The increase in the number of strong earthquakes today can be linked to the phenomenon of polar change and are both byproducts of the Earth core turbulent liquid iron and outdoor hot, raging around a solid iron inner core as hot as the Sun and rotate faster than the rotation of the planet itself . The Earth mantle and crust are floating above an electrically conductive stormy sea which produces molten iron magnetic field of the planet called the dynamo effect . The magnetic north pole was located in 1831 and has been regularly followed up to the most recent measurement taken some time ago in 2001. Meanwhile , the division has proposed an amazing 1.100 kilometers . In fact, since 1970, the division was much faster , from 10 km to 40 km per year , an incredible four-fold increase . We do not know why there was no mission to physically locate the magnetic North Pole since the last observed position in 2001 . There are only estimates of its current location. As the speed of its movement has accelerated up by a factor of four in such a short time , it might be reasonable to ask whether his speed has continued to increase since 2001. Apparently the incentive is there to check . Polar change is caused by substantial changes in the movement of the molten iron outer core . Dr. Tony Phillips Science News – NASA has identified the following information … About 400 times polar shift took place during the last 330 million years, while the average interval between reversals in recent geological time was about 200,000 years . Reversal of the last field Earth occurred 780,000 years ago and we are apparently very late. Most of the evidence gathered from the analysis of certain types of rocks indicates that a polar shift inversion process can take up to 1,000 or 8,000 years . However there have also been reports of the process itself completed much faster than that, the most famous story are measures of lava rock at Steens Mountain , Oregon , which indicate that the magnetic field has been moving up to 6 degrees per day for a particular position polar nearly 16 million years. 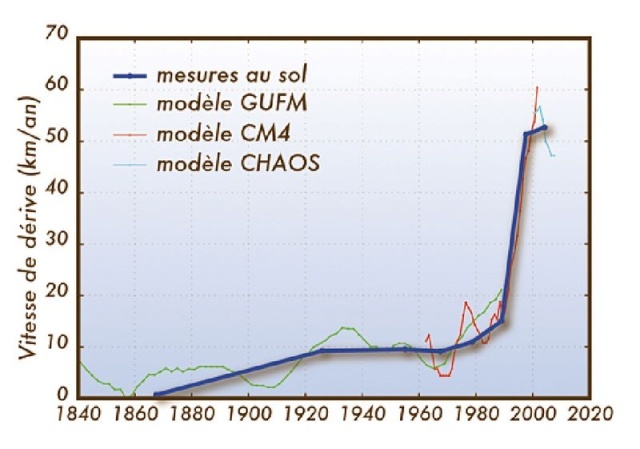 The process of polar change itself is of concern not only for its effects on the earth such as volcanoes and earthquakes , but if the behavior is such that the first field reduces to zero before reconstruct, Earth will be exposed without sufficient defense to solar radiation, which would be disastrous . In fact , the magnetic field is now rapidly weakening according to some scientists . There are several theories on how a reversal would take place , some still maintain protection against the sun while others do not. 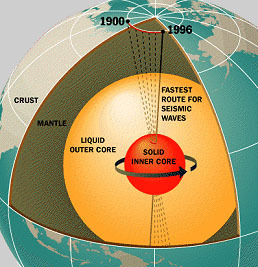 We know that the current magnetic pole shift occurs quickly, and we know that this is the result of an outer core tumultuous evolution . We could conclude that this cause – effect could contribute to other changes observed on the surface of the planet such as the movement of tectonic plates resulting in more earthquakes today. So far in 2010 , we observed a significant increase in earthquakes, especially in the range of magnitude higher . Everything we see here on recent magnetic pole shift and today earthquakes can all be linked and can be reflections of changes occurring deep beneath our feet. Drift velocity of the position of the magnetic north pole since 1840, based on field measurements (blue curve) and three different geomagnetic models for three different time intervals. This phenomenon of sudden acceleration is not yet fully explained. It could be related to an increase in the magnetic field flux in the polar region north of the Earth’s core. This would be caused by the expulsion of the magnetic field lines of the core, in a close to the origin of the appearance of sunspots mechanism.